Job on a dunghill talking to his friends, full-page miniature from a Book of Hours, illuminated in the workshop of Jean Bourdichon. France, Tours, c. 1490-1500. The thematic presentation on resilience centres on the story of Job. Beautifully painted miniatures in fine Books of Hours show Job on a dunghill, the epitome of human misery, but also of resilience. Job’s harsh destiny is the result of a wager between God and the devil. God’s confidence in Job’s devotion is so strong that he allows the devil to tempt and torture Job ceaselessly. Job loses everything he owns: his children, his flocks, his house. Finally, he resumes his seat on a dunghill to publicly do penance for his sins because all of the unforgiving visitations appear to him as proof that he – unintentionally – has committed a severe sin. His wife and three friends tell him to abandon his undeterred faith. They argue that a God who punishes unjustly is not to be worshipped. But Job stubbornly refuses to do so and stays firm in his belief, so that in the end he regains more than he had lost. 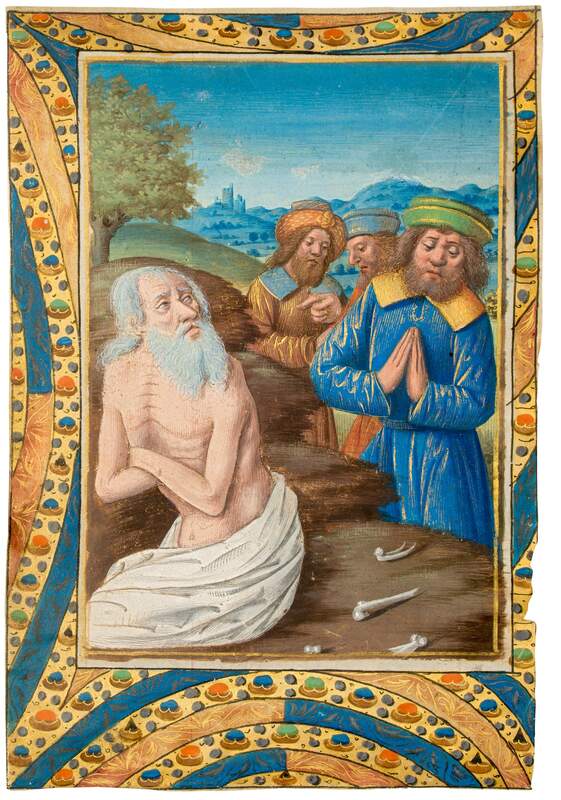 Our presentation at Frieze Masters includes images of Job in the delicate Feydeau Book of Hours, in an extravagant Book of Hours by an illuminator from the circle of the Monypenny Master, and a lavishly illuminated Book of Hours that was owned by Jean le Vayer, seigneur de Faverolles, as well as a single leaf from a Book of Hours, illuminated in the workshop of Jean Bourdichon. Johannes de Capua, Buch der Weisheit der alten Weisen (incunable). Urach: Conrad Fyner, c. 1480-1481. The “curiosity cases” present highly interesting manuscripts and early printed books that perfectly illustrate the thirst for knowledge in the Middle Ages and the Renaissance. Two very unusual manuscripts portray the curiosity about unknown lands. The Compendium for Juan II, King of Castile and Leon includes a provocative map of the world from just before the Age of Discovery, whereas the rare San Salvador Huejotzingo manuscript is a unique witness to the early days of the colonialization of Mexico. In contrast, curiosity about human nature is the main theme in two books of fables. 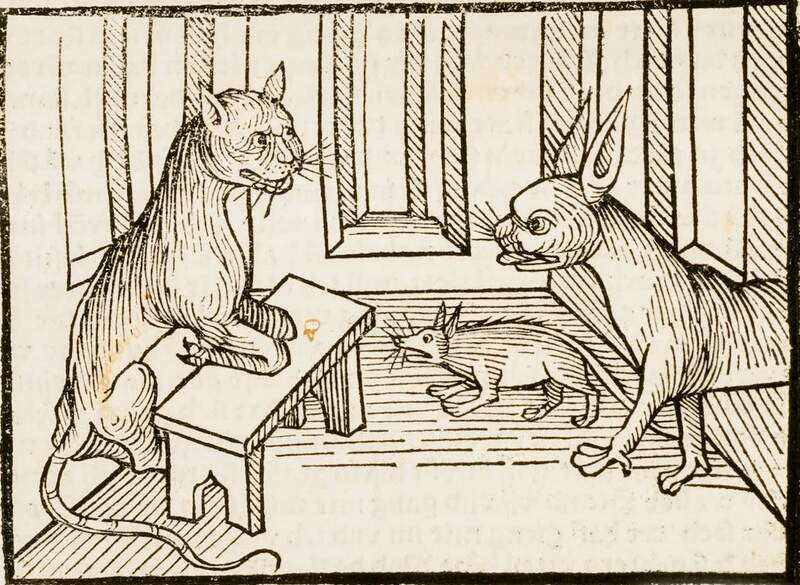 The Ashburnham Buch der natürlichen Weisheit, is the only known copy of this popular collection of fables and apologues still in private hands. This manuscript on paper has 84 pen-and-wash drawings that convey eternal truths about the human psyche. Similarly, the Buch der Weisheit der alten Weisen, John of Capua’s Latin translation of the Directorium humanae vitae, is considered a treatise on political and human conduct. The amusing fables take up occurrences in human life through the use of animals, which lead to rather unexpected morals. 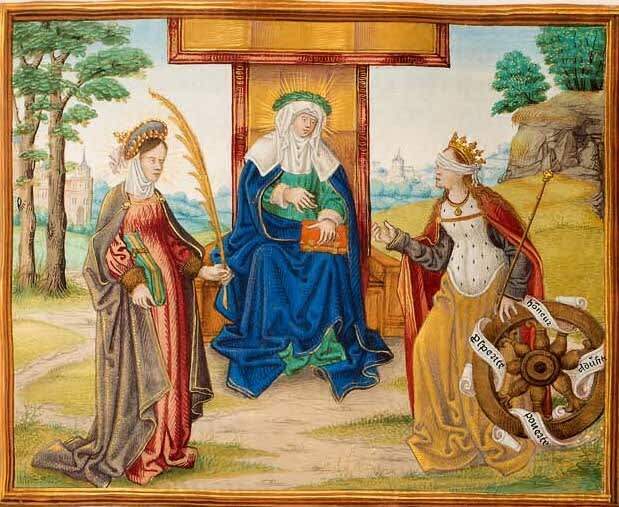 Martin Le Franc, Livre de L’estrif de fortune et de vertu, illuminated manuscript on vellum, Netherlands, Valenciennes/Cambrai, 1482 and c. 1519. 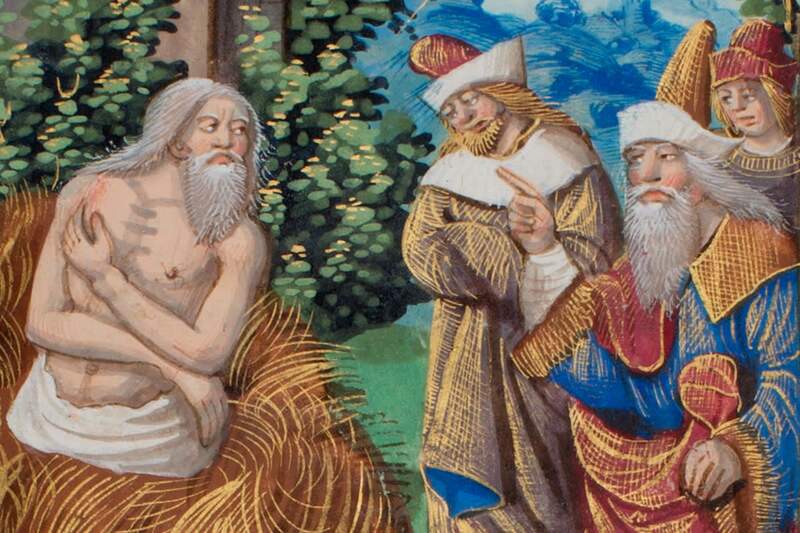 Another thematic case explores the idea of virtue with three beautifully illuminated manuscripts. Martin Le Franc’s Livre de l’estrif de fortune et de vertu includes some interesting lessons about good luck vs. virtue. The text relates a verbal joust between Lady Fortune and Lady Virtue who argue over “the government of this world”, while Lady Reason referees. Jean Bouchet’s Life of St. Radegund is the illuminated biography of Radegund, a virtuous young woman who became queen of France in 540 when she married the despotic Clothaire, King of the Franks. She then devoted herself to serving the poor and infirm and became a symbol of what is righteous, good, and beautiful. The Golden Legend, or Légende dorée, is one of the classic works of the Middle Ages, containing lively tales of saints’ miracles written in a simple style to address a wide audience. The French version became popular among the nobility for its valuable lessons on a virtuous life. The manuscript at hand came from the grand library of King René d’Anjou and Jeanne de Laval.